This one goes out to any budding explorers out there. 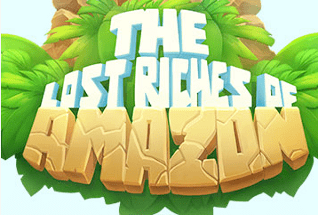 Lost Riches of the Amazon does exactly what it says on the tin, really. Enter a temperate and humid jungle setting and trek through the harsh terrain to emerge into a clearing where you will be greeted with ancient ruins, tribesmen, and bonus reels. Spin your way through an authentic game board filled with colonial explorers, maps, binoculars, an array of wild animals including the possum. Here's an impressive slots play you can find in our site. Foxium is a new and up-and-coming online slot games developer for online slots games. Established in 2015, this Estonian based company has already had two successfully popular games in Big Time Journey and Stereo Miami. Their fully 3D animated games promise an experience that players have not had before, offering something different and special in a very competitive market. With more games forthcoming, this newcomer is one to keep an eye on. The Lost Riches of Amazon will transport you to the most wonderful of places without ever having to leave your home. Filled with vast, lush green forests and exotic animals the Amazon is filled with mystery and danger. This online slot game is gargantuan. You have 5 reels and 2048 paylines! The game reels are filled with exclusive symbols, not a single card symbol in sight. Every inch of the grid is being utilised, fully immersing yourself in the gameplay. Bets can be set at 50p per spin up to a maximum of £125 per spin. This good betting range ensures that this online slot game has something for everyone, from low betters to high rollers. The Wild symbols in this game do more than just substitute other symbols on the reels. That’s not the only thing that has changed, you now need to collect them. It’s not just about making a winning combination, you now need to hit the right number too. Your aim is to collect 12 Wild symbols during the gameplay, and when you do you will be rewarded with 3 more Wild symbols spread out in random locations. If you collect 10 of the Golden Monkey Head symbols you will trigger one of the bonus games: Match 2, Wheel of Fortune, and Progressive Wilds of Tall Wilds. In these bonus rounds, you get the chance to mix and match your symbols to find a prize, spin a wheel to receive multipliers and spin monkey heads for free spins. Here's a list of best UK online slot games you can choose from, including this one. Collect 10 Monkey Heads to trigger the Match 2 bonus game, here you have to keep picking tiles from the board until 2 skeleton heads are displayed. Matching 2 will win you the prize displayed. Collecting 20 Monkey Heads will activate the Wheel of Fortune bonus feature where you get to win multiplier prizes. Spinning 30 Monkey Heads will reward you with 8 Free Spins and Progressive Wilds, if you spin a Lucky Coin in this feature you win even more Free Spins. Finally, collect 40 Monkey Heads and you will be awarded 5 Free Spins with Tall Wilds which take up more space on the reels than your normal sized symbols providing you with extra wins. 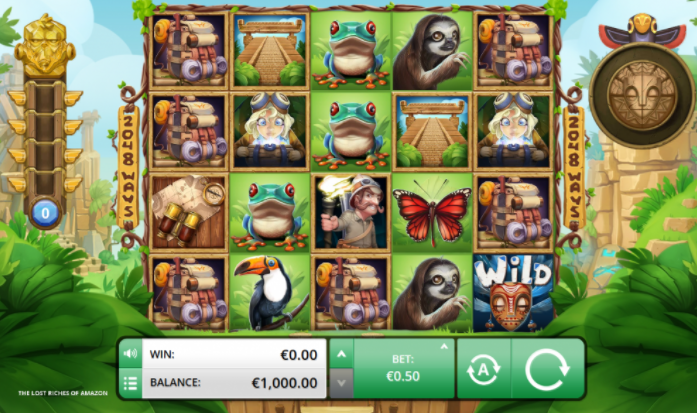 If you love adventure and animal themes you are going to love this colourful online slot game from Foxium. The promised an experience you never had before, and something extra special, which they have delivered in this impressive online slot game. It’s big, it’s bold and very beautiful. Another sick game to try is Fluffy Too.